The Rush Archives has just been notified of the passing of Luther P. Christman, first dean of Rush University’s College of Nursing. Christman died Tuesday in Nashville, Tennessee. In 1972, Christman became the first dean of the Rush University College of Nursing and vice president for nursing affairs at Rush-Presbyterian-St. Luke’s Medical Center. With strong administrative support, he moved to implement all the components for his plan for nursing, which would come to be known as the Rush Model for Nursing. Christman helped establish the National Male Nurse Association in 1974, which became the American Assembly for Men in Nursing in 1981. He was a strong supporter for the recruitment of male nurses, believing that diversity could make the nursing profession stronger. A gift from the John L. and Helen Kellogg Foundation in 1979 funded at Rush the first National Center for Excellence in Nursing in the United States. Christman retired from Rush in 1987. In 2004, Christman was inducted into the American Nurses Association’s Hall of Fame. In 2007, the American Nurses Association established the Luther Christman Award. The American Assembly for Men in Nursing began awarding its own Luther Christman Award in 1975 to people who have helped further the cause of men in nursing. Christman graduated from the Pennsylvania Hospital School of Nursing for Men in 1939, and married nurse Dorothy Black (Dorothy Christman) the same year. He went on to earn a baccalaureate degree from Temple University, 1948, an Ed.M. in clinical psychology from the Philadelphia Psychoanalytic Institute, and his Ph.D. in Sociology and Anthropology from Michigan State University. He served as director of nursing at Yankton State Hospital in South Dakota and advisor for the Michigan Department of Mental Health in the 1950s. In the 1960s, he was an associate professor in psychiatric nursing at the University of Michigan, Ann Arbor, then dean of the nursing school and director of nursing at Vanderbilt University. There, he worked to rebuild the school, acquiring substantial funding, developing nursing as an applied science and introducing the practitioner-teacher model. Although I never had the chance to meet Luther Christman, I had the pleasure of processing his collection in the Rush Archives a few years ago. A strange thing happens when you go through a person’s papers, their photographs, memos, letters, and other documents. You’re touching what they touched, reading what they read and wrote, and you end up feeling a connection to your subject that you probably don’t get from a simple biography. Only yesterday, I was telling someone about Christman’s work at Rush, the barriers he’d faced as a male nurse, and the advancements he’d made in nursing education and the nursing profession. I had such admiration for him and loved to share his story with others. So, it’s with great sadness I learned of his passing today. We would love to hear your own stories on Luther Christman. Please feel free to contact the Rush Archives. Nathalie Wheaton, MSLS, is assistant archivist for the Rush University Medical Center Archives. Do you have a question about Rush’s history? Contact the Rush Archives at (312) 942-7214 or rush_archives@rush.edu. Visit us at http://www.lib.rush.edu/archives. 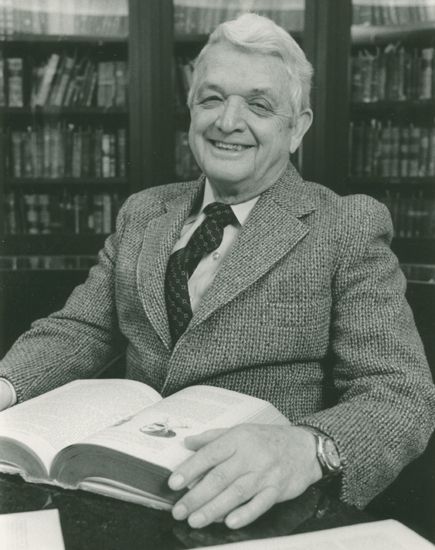 The Luther P. Christman Papers in the Rush Archives include correspondence; articles, papers, and speeches by Christman; records related to Christman’s time as dean of the nursing schools at Vanderbilt University and Rush University; and material related to nursing and health care conferences and awards; and photographs. The Rush Archives also houses related collections, including video and audio of interviews with Christman, the American Assembly for Men in Nursing Records, and the records of the Rush University College of Nursing. This entry was posted in Nursing, Rush Archives, Rush University. Bookmark the permalink. I too am deeply saddened by Luther Christman’s passing. Although I did not meet him personally, his legacy was one factor in my decision to enroll in the nurse doctorate program at Rush several years after he retired. It was an honor to graduate from the school that had such an impact on Nursing and Nursing scholarship due to his leadership and vision. I worked with Dean Christman 1974-1976 as his Administrative Assistant. He was one of the most pleasant people I have ever worked with. He will surely be missed but his contributions and accomplishments in the nursing field will be a tribute to him for many years to come. What a pleasure and honor to have worked with him. I am a volunteer in the Rush Medical Archives, and I have recently had the opportunity to review some information relating to Luther Christman’s work and wonderful achievements in the field of nursing. He has left an impressive legacy. Dr. Luther was so gracious to have reviewed my very first book as a novice writer, Doctors Are People Too, that I wrote way back when I was just an undergraduate student. I’m a physician now and have published a great deal since but I have always been most proud of his acknowledgment and kind review that encouraged me and jettisoned me from just a writer to a critically reviewed one. A truly wonderful educator, writer, activist and leader in health care. I was in the first graduating class at Rush. I started in 1973 and graduated in 1975. Luther was indeed a gracious and gentle soul and caring. There is no doubt that nursing school is stressful. I’m not sure all of the decisions made in those days were wise. I remember my last day at Rush, I was sitting on the floor outside his door waiting for him to return from a meeting. I was having a really bad day. In my last quarter of my senior year I was in a coronary care rotation.I had a patient, a dentist who reminded me of my father who had died in 1961. For that rotation we each took a single patient and followed him from admission, prepped him for surgery, observed the open heart surgery, cared for him post-op. We were having trouble weaning him off the ventilator.I worried constantly about him. It was almost the last day of the rotation. We were trying once again to wean him when the instructor tripped on the ventilator cord and cut off the electricity to the ventilator. I was in bad shape so when I told Luther what had happened, that I wasn’t sleeping, that I couldn’t hold it together, and that I wanted to leave. He let me go, I got my degree, passed the nursing exam. I always remembered his kindness. Needless to say, I am not a ccu nurse. I went into psych and community health and stayed as far away from hospitals as possible.